Creamy Lemon Pasta has a light sauce made with lemons, garlic, parmesan cheese, cream, olive oil and spices. 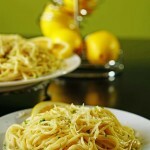 The lemon spaghetti recipe is bright and tangy. It is a quick and easy meal to make! Start by putting a large pot of salted water on the stove to boil. When it reaches a rolling boil, drop the spaghetti in and cook according to package directions to just al dente. While the pot is heating & spaghetti is cooking continue to prepare the sauce. Chop the garlic and place in a large deep fry pan over low heat with olive oil. Don't all the garlic to brown, this will make it bitter. Add the red pepper flakes and black pepper. Slowly sauté the garlic for about 10 minutes, along with the spices. Next add the lemon zest and whipping cream. Continue to stir and the flavors will slowly combine. When the pasta is done, turn the heat off from the sauce. Add in the lemon juice. Stir to combine, then begin transferring the cooked noodles to the sauce mixing well to combine. Top the noodles with the shredded parmesan cheese and mix again. Garnish with parsley & chopped basil.